Taspoglutide, a glucagon-like peptide-1 agonist, like native glucagon-like peptide-1, delays gastric emptying time and prolongs intestinal transit time, which may alter the pharmacokinetics of concomitantly administered oral drugs. The effect of taspoglutide on the pharmacokinetics of five oral drugs commonly used in patients with type 2 diabetes mellitus was assessed in healthy subjects. 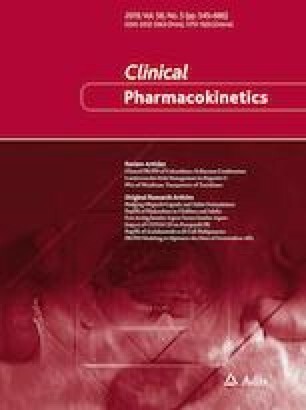 Five clinical pharmacology studies evaluated the potential drug–drug interaction between multiple subcutaneous taspoglutide doses and a single dose of lisinopril, warfarin, and simvastatin and multiple doses of digoxin and an oral contraceptive containing ethinylestradiol and levonorgestrel. The extent of interaction was quantified using geometric mean ratios and 90% confidence intervals for the maximum plasma concentration and area under the plasma concentration–time curve. In addition to pharmacokinetics, pharmacodynamic effects were assessed for warfarin and the oral contraceptive. Among the tested drugs, the effect of taspoglutide on the pharmacokinetics of simvastatin was most pronounced, on the day of taspoglutide administration, the average exposure to simvastatin was decreased by − 26% and − 58% for the area under the plasma concentration–time curve and maximum plasma concentration, respectively, accompanied by an increase in average exposure to its active metabolite, simvastatin β-hydroxy acid (+ 74% and + 23% for area under the plasma concentration–time curve and maximum plasma concentration, respectively). Although statistically significant changes in exposure were observed for other test drugs, the 90% confidence intervals for the geometric mean ratio for maximum plasma concentration and area under the plasma concentration–time curve were within the 0.7–1.3 interval. No clinically relevant changes on coagulation (for warfarin) and ovulation-suppressing activity (for the oral contraceptive) were apparent. Overall, multiple doses of taspoglutide did not result in changes in the pharmacokinetics of digoxin, an oral contraceptive containing ethinylestradiol and levonorgestrel, lisinopril, warfarin, and simvastatin that would be considered of clinical relevance. Therefore, no dose adjustments are warranted upon co-administration. The online version of this article ( https://doi.org/10.1007/s40262-019-00757-1) contains supplementary material, which is available to authorized users. The authors thank Elke Zwanziger, Katja Heinig, Jon Talbot, Christelle Vistuer, and Nathalie Lambert for providing scientific review, operational, and technical support. This study was funded by F. Hoffmann-La Roche Ltd.
Katrijn Bogman, Jochen Brumm, Carsten Hofmann, Mylène Giraudon, Markus Niggli, Carolina Sturm-Pellanda, Annette Sauter, Stefan Sturm, and Christophe Schmitt are employees of F. Hoffmann-La Roche Ltd. Katrijn Bogman, Carsten Hofmann, Carolina Sturm-Pellanda, Annette Sauter, Stefan Sturm, Christophe Schmitt, and Bernhard Mangold are shareholders of F. Hoffmann-La Roche Ltd. Bernhard Mangold was an employee of F. Hoffmann-La Roche Ltd. at the time the studies were conducted and reported. Loghin C, de la Pen˜a A, Cui X, Chien J. Gastric emptying effects of once weekly dulaglutide in patients with type 2 diabetes mellitus [poster]. In: 23rd Annual Scientific and Clinical Congress of the American Association of Clinical Endocrinologists; 19 May 2014. https://www.mdlinx.com/endocrinology/conference-abstract.cfm/12181/?nonus=0&searchstring=&coverage_day=0&page=1. Accessed 3 Mar 2019. Byetta (exenatide), prescribing information. 2009. https://www.accessdata.fda.gov/drugsatfda_docs/label/2009/021773s9s11s18s22s25lbl.pdf. Accessed 13 Feb 2019. Bydureon (exenatide extended-release), prescribing information. 2012. https://www.accessdata.fda.gov/drugsatfda_docs/label/2012/022200s000lbl.pdf. Accessed 13 Feb 2019. Lyxumia (lixisenatide), summary of product characteristics. 2013. http://www.ema.europa.eu/docs/en_GB/document_library/EPAR_-_Product_Information/human/002445/WC500140401.pdf. Accessed 13 Feb 2019. Zocor (simvastatin) prescribing information. 2012. https://www.accessdata.fda.gov/drugsatfda_docs/label/2012/019766s085lbl.pdf. Accessed 13 Feb 2019.